Depending on your location, you may have access to organic foods at your local grocery store or farmer’s market. Of all available foods, organics are typically in small supply and…consequently, are thought to be “different” or “unusual”. 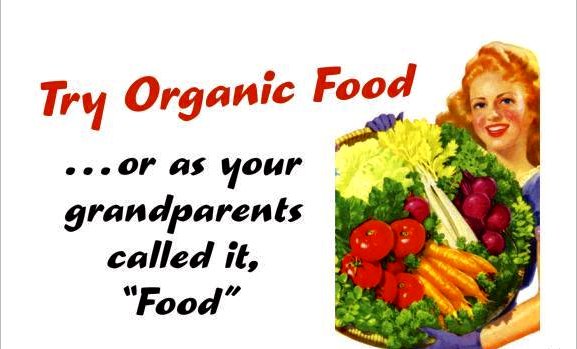 It is for this reason, I believe, that non-organic foods are referred to as “conventional” (Definition: Based on or in accordance with what is generally done or believed). No matter where you stand on organic food, it’s important to acknowledge that organic essentially was considered “conventional” until very recently. As for produce, it wasn’t until the middle of the 20th century that synthetic pesticides were used on crops. Many of you reading this article are among the first generation who are expected to consume produce sprayed with toxic residues, because that is what is “generally done or believed”. Similarly, it wasn’t until the 1940s that “factory farming” (Definition: Raising livestock in confinement at high stocking density) became commonly accepted. Until then, this was rather unconventional, because the business model was completely unsustainable before the widespread use of antibiotics. One thing is for certain – technological advances (i.e. the use of pesticides, genetically modified organisms, antibiotics, hormones, etc) have enabled us to produce mass quantities of food in a more cost-efficient manner. It has yet to be determined, however, whether or not these advances are helping or hurting us in the long run. We are merely at the forefront of this different way of doing things, that is being referred to as “conventional”. It is basically like we are all living within a scientific experiment. Our food supply is continuously evolving in more ways than we are aware. The phrase “they don’t make ’em like they used to” firmly applies, that’s for sure. I believe that nutrition and health go hand in hand. In other words, what we eat has a direct effect on our well-being. I have no data to support that the ingestion of pesticides and GMOs are harmful to our health, but I do know that global rates of non-communicable chronic diseases (i.e. heart disease, diabetes, cancer, mental illness) are on the rise, some of which at epidemic proportions. Meanwhile, very few people want to stop and take the time to determine the root cause. I personally choose to take the conservative approach and eat organic foods, whenever possible. In my estimation, eating organic food is the safe and “conventional” approach.